We've all marvelled out how prolific Lil Wanye has managed to be despite being locked up in prison. 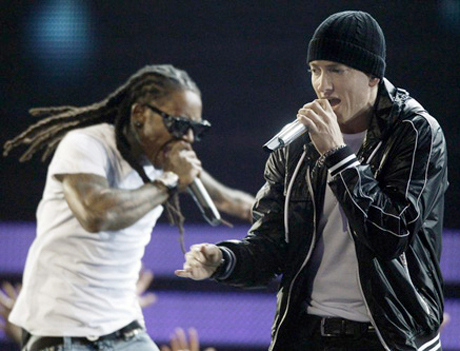 Now, Weezy has appeared in yet another new video, this time for Eminem's "No Love." An anti-bullying clip, it shows Lil Wayne rapping against a plan black background, which is inter-cut with footage of a kid being picked on (and ultimately fighting back) at school. The song appears on Eminem's Recovery LP, and samples Haddaway's "What Is Love" - that's right, the song from from A Night at the Roxbury. Watch the video below.